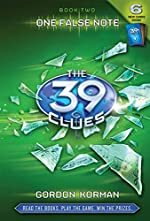 Review: The 39 Clues: One False Note is the second book in “The 39 Clues” series and it is written by Gordon Korman. It features Amy and Dan Cahill on a race against other members of the enormous Cahill family to find the treasure left behind by their late grandmother. Amy and Dan Cahill, along with their au pair Nellie Gomez and their grandmother’s cat, must race to Vienna, Italy after finding the first clue in the race to recover the treasure hidden by their grandmother Grace Cahill. Once there they must evade the other members of their family on the hunt for the treasure, while figuring out just what Mozart has to do with the next clue. They have to infiltrate an enemy base and act as maids, but do they have enough time? Who can they trust and is Mr. McIntyre really trying to help or does he want something more? The plot twists and turns, leaving the reader wondering what will happen next. One False Note is a well written book that is packed with action. It is easy to understand and can be enjoyed by many young adults. The characters fit so well together it is amazing that this is only the second book in the series. With alliances made and broken it can be tough to tell who is on whose side at times though. Though not very long, the author does a great job of creating a sense of suspense and unknowing. Also there is another book planned and Korman does a marvelous job of creating a cliff hanger at the end to get reader to read the next book. Overall I thought One False Note was an extremely good book and I would recommend it for all middle school students. On a five star scale I would give this book a five. It is easy to understand and it has a great plotline. Next time you are at the library or at your local bookstore, be sure to pick up The 39 Clues: One False Note. Review written by Eric, Grade 8. Date of review: April 2009.